Propane Central maintains a large inventory of propane storage tanks to allow timely installation for new customers. A typical home will usually need a 500 gallon tank. Large homes, or a home with a swimming pool or large shop, may require a 1000 gallon tank. A trained Propane Central service representative will evaluate your potential gas usage based on the appliances you have, design of your home and your family’s lifestyle in order to select the appropriate size tank for you. 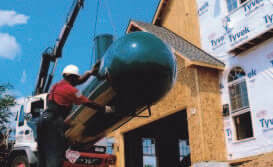 Underground propane tanks are also available from Propane Central . These tanks have the benefit of being buried and out of sight in your yard. When you choose to have Propane Central provide a company-owned tank, you get the benefit of free tank maintenance. You take pride in your home and yard, and Propane Central wants to keep its tanks looking good as well. We provide scheduled tank painting and leveling, as we consider this an important part of maintaining the gas system. 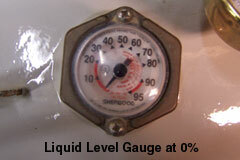 Most propane tanks have a liquid level gauge that will tell you the percent level of fuel in the tank. The gauge will be located on the top surface of the tank. If the tank’s lid is in the middle of the tank, the gauge will generally be mounted flat with the tank surface and outside of the lid. 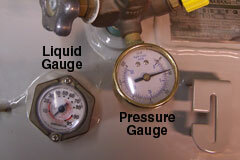 Most gauges are marked with numbers from 10 to 100. These numbers mark percentages, so if the gauge needle is pointed to 62, then your tank is 62% full. If it is a 1000 gallon tank, then you have approximately 620 gallons of gas in the tank. If it is a 500 gallon tank, then you have approximately 310 gallons of gas in the tank. Unlike the meters on delivery trucks, the tank gauge is not temperature compensated so the read is an estimate of the fuel level. 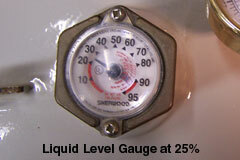 The tank gauge indicator is not a precise measuring device, but gives a general reading of accuracy. The main valve is located under the tank lid. 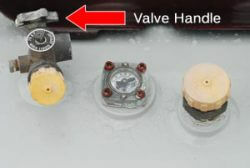 Turning the valve handle Clockwise, like a water faucet, will turn the propane system OFF.